Published July 5, 2016 at 592 × 423 in Hospitality 525 5-Star Pillow Top Hotel Mattress. Our beds and bed parts are manufactured domestically in the United States of America. 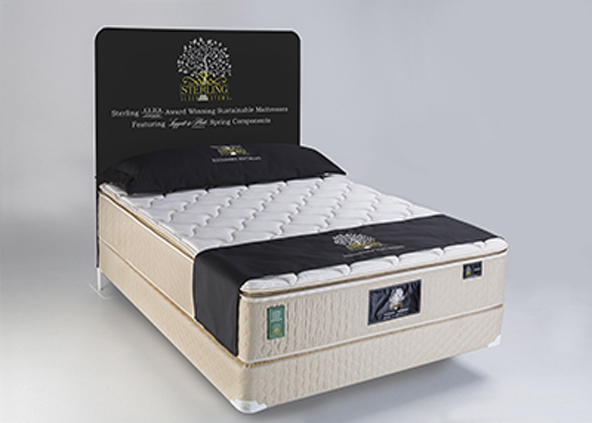 Sterling Sleep Hospitality's beds are assembled in our Southern California facility. The spring assemblies we use in all of our beds come from Leggett & Platt, the largest domestic supplier of spring assemblies in the United States. The foam we use in our mattresses are certified by CertiPUR-US® which means you can be confident that the flexible polyurethane foam inside our beds meets CertiPUR-US® standards for content, emissions, and durability, and has been analyzed by independent, accredited testing laboratories. Copyright © 2018 Sterling Sleep Systems. US Patents: 7,191,483 - 7,386,903 - Other Patents Pending. All Rights Reserved.